Metema, in Ethiopia's north-west, was once a people smuggler's paradise. It was from here that Haimanot, aged just 16, gathered all her belongings, borrowed 3,000 Ethiopian birr ($140; £95) and crossed the border into Sudan in search of a better life. She travelled at first on foot under cover of darkness and with the help of an Ethiopian smuggler, who had promised to take her first to Sudan's capital Khartoum, then on to Libya. "I was not in school and I could not find a job here in Ethiopia, so I decided to make the journey to Europe to try and make something out of myself," she tells me. But she never made it out of Sudan. After running out of money in Khartoum she did odd jobs for a year, trying to raise enough money to pay another group of smugglers to take her northwards. Things went from bad to worse and she was arrested by Sudanese police and spent weeks in prison. "It was the scariest period of my entire life. I was arrested by police and they fired shots at me when I tried to escape. "I was then arrested and beaten up by some 15 police officers," she says, three months after returning home. Haimanot's story is not unique in Metema, where nearly everyone we spoke to knew of friends, relatives or neighbours who had crossed the border in the hope of a better life in Europe. Many Eritreans - one of largest group of migrants to Europe - would also pass through the town. Now as Europe grapples with an influx of migrants, Ethiopia's government has intensified a crackdown on the smugglers it blames for luring thousands abroad. "This was and is still a big problem in Metema," says the town's mayor, Teshome Agmas. "Smugglers are luring the young and old and then dumping them in the deserts or even killing them if they can't afford the money required to complete the journey. "We had to do something and that is why we joined the government crackdown." The government says it has arrested more than 200 smugglers operating along its 700km (435-mile) border with Sudan this year and has begun a massive awareness programme to inform the public about the dangers of making such perilous journeys. It was spurred into action after 30 Ethiopian Christian migrants were killed in Libya by Islamic State militants in April. 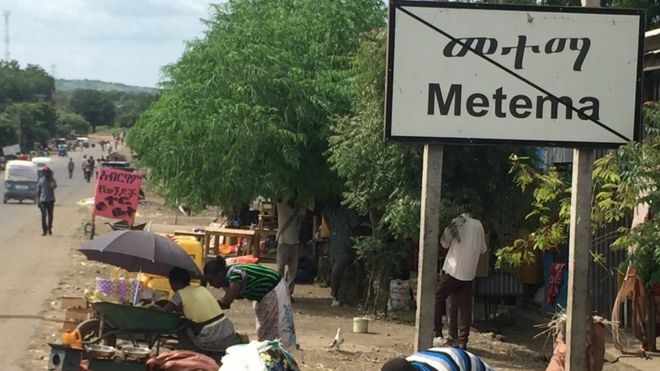 More than 100 traffickers have been arrested in Metema, which also attracts migrants from neighbouring South Sudan and Somalia. At one point more than 250 people were crossing the border into Sudan through Metema each day. But after the police intensified patrols, smugglers were forced to seek alternative routes into Sudan, through heavily forested and mountainous areas. "We are telling the smugglers that we are coming for them if they do not stop," the mayor said. The Ethiopian government has also proposed harsher punishments for people smugglers. The justice ministry has presented parliament with a bill that could see convicted smugglers facing the death penalty. It has also embarked on a massive awareness campaign to dissuade the young people from making that perilous journey across the deserts and the Mediterranean. The government has already banned Ethiopians from going to Middle East to work as domestic workers in 2013 because of the abuse some have suffered there. Officials believe it is having an impact on some. Twenty-six-year-old Alemtsehay Gebreselassie, who runs a cafe in a village next to Metema, said that after listening to some of the warnings, she decided to stay put. "I watched videos and TV programmes that show the dangers of illegal migration - and the house maids splashed with boiling water and thrown out from buildings [in the Middle East]," she said. "I don't want to make such an attempt. I am much happier here despite life being tough." But many Ethiopians are still living in extreme poverty in towns like Metema, and some I spoke to - who did not want to be named because of the crackdown - are still prepared to risk everything for a better life elsewhere.